Talk, listen and watch with comfort from your favourite chair, anywhere in the room. 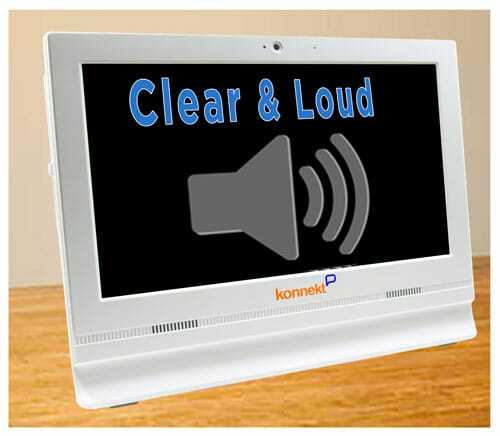 The Konnekt easy to hear phone with video is LOUD and clear, adjustable, and not at all “tinny”, thanks to the two LARGE in-built speakers – MUCH bigger than the speakers in an iPad, tablet or laptop. We can make your Videophone EXTREMELY loud if you have trouble hearing, or softer if you must use it in a room shared with others. The Konnekt easy-to-hear phone with video is great for those who are hard-of-hearing. The large 15-inch (38cm) screen is big enough for you to augment your conversation with lip reading. Friends and family can screen-share from any PC or MAC computer. They can send text by typing, or by using automatic voice-to-text (ask us how). There’s nothing at all that the Konnekt user needs to do – simply watch the text magically appear, just like captions on a movie. If you use a hearing aid, implant or headset, Konnekt has solutions for those too. Just ask! The sensitive microphone conveys every nuance in your speech, and lets you walk around the room and do other things while you talk in your normal voice. It can even hear sounds from another room. A SUPER-sensitive optional external microphone is ideal for those with very soft voices, or where there is a strong need to communicate from other rooms when Videophone auto-answers trusted contacts. How does it help those with a hearing difficulty? 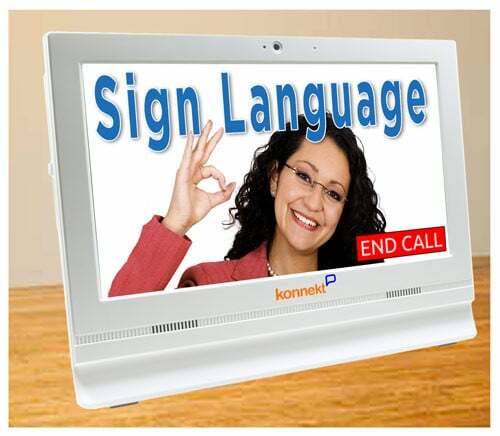 The Konnekt Videophone is extra loud, has customized ringing, is large enough for sign-language and lip reading, and supports hearing aids, remote text sharing and remote speech-to-text. See Hearing Impaired applications, or see Konnekt Disability Videophone designed specifically (and with additional unique features) for those with hearing loss or deafness.